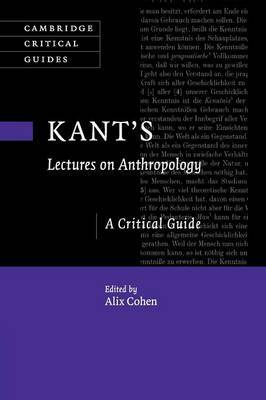 Kant's lectures on anthropology, which formed the basis of his Anthropology from a Pragmatic Point of View (1798), contain many observations on human nature, culture and psychology and illuminate his distinctive approach to the human sciences. The essays in the present volume, written by an international team of leading Kant scholars, offer the first comprehensive scholarly assessment of these lectures, their philosophical importance, their evolution and their relation to Kant's critical philosophy. They explore a wide range of topics, including Kant's account of cognition, the senses, self-knowledge, freedom, passion, desire, morality, culture, education and cosmopolitanism. The volume will enrich current debates within Kantian scholarship as well as beyond, and will be of great interest to upper-level students and scholars of Kant, the history of anthropology, the philosophy of psychology and the social sciences.